In 2012, the Department of Radiation Oncology approached the St. Vincent’s Foundation and St. Vincent’s Hospital Administration with a plan to build a new, state-of-the-art cancer center, providing the latest in technology within a comprehensive patient-focused facility. With challenges of available capital and site constraints, Johnson Development was able to bring to the table a structure that would achieve the goals for each party involved. Johnson Development’s structure was able to take the construction risk burden off the hospital and Foundation, but still allow the use of their unique and separate capital though a condominium structure at completion. The Foundation was able to raise funds from the community to fund and own the linear accelerator bunkers as well as the linear accelerators themselves. The Hospital was able to use their tax-exempt capital for the balance of the cancer center without the danger of providing inurement to independent physician tenants occupying the upper floors. Johnson Development structured the upper floors as a stand-alone medical office building, owned by Johnson Development and the physician tenants. The MOB was delivered on-time and within budget. 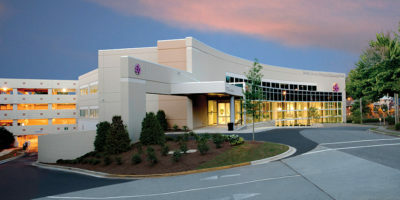 Johnson Development was responsible for all activities as part owner and developer, including organization of physician partners, financing, leasing, oversight of design, and construction of the project as well as the immediate site work around the MOB. Johnson Development will provide ongoing property management services.